A Traffic Police officer at the accident scene on Friday. David Oduut. An old student of United Media Consultants and Training (UMCAT) Mbale Thursday night drove a car into a students’ party leaving two dead. Christine Nalumansi died on the spot while Ronald Katumba passed on later at Mt Elgon Hospital where he had been admitted in critical condition. The victims were both students of Journalism and Mass Communication. They had joined their counterparts from UMCAT Mbale Soroti, and Arua campuses for a three-day annual cultural gala in memory of former lecturers, the late Bbaale Francis and Charles Hingenyi. The accident occurred at around 9pm at Plot 1 Admas Road, Senior Quarters Wanale Division in Mbale Municipality where UMCAT Mbale branch is located. According to witnesses, a former journalism student identified as Isaac Opero, currently working at Mbale Resort Hotel, drove a Toyota Filder registration number UAU 623N towards the school gate at high speed, knocking it open before running over the two students and rammed into an office building. “He appeared to be drunk but may have wanted to impress either a girlfriend or onlookers, since it was even the first time he was seen driving,” Jane Abalo, a student, told PML Daily. A gaping hole in a wall where the vehicle had rammed into after killing the two students. David Oduut. Steven Ahwera, the officer in-charge of Mbale Central Police Station, confirmed the incident, saying they have launched a manhunt for the driver. He appealed to anybody having knowledge of Opero’s whereabouts to tip Police. 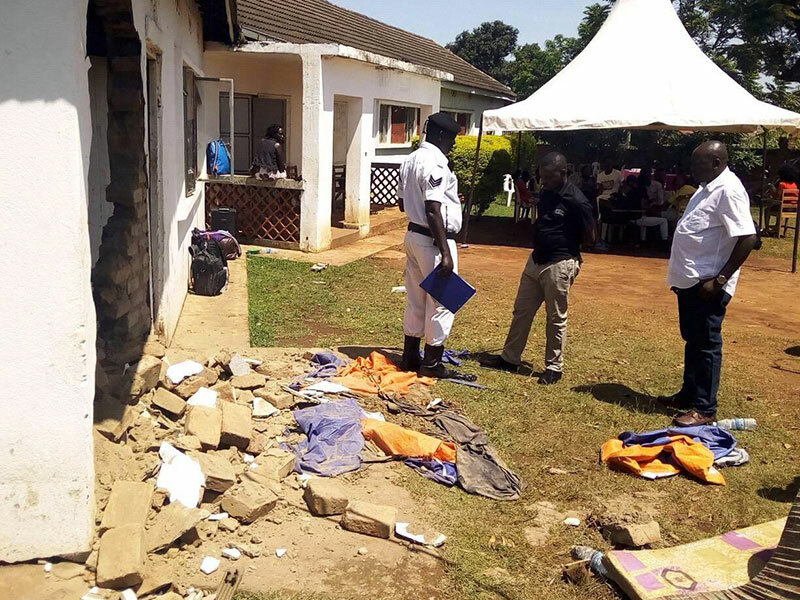 “These students were having dinner at a tent at around 9:25pm when this incident happened; we regret that the ill-fated driver, Isaac Opero, is an alumni at school and is currently on the run,” Ahwera told the media at his office Friday afternoon, adding that police were also investigating the motives of drive-in. “We cannot rule out anything, but we will look at all clues and give a report on our findings late,” Ahwera said. Joseph Etadu, a lecturer at UMCAT Kampala campus, regretted the incident. He said they are in touch with the bereaved families to make burial arrangements.